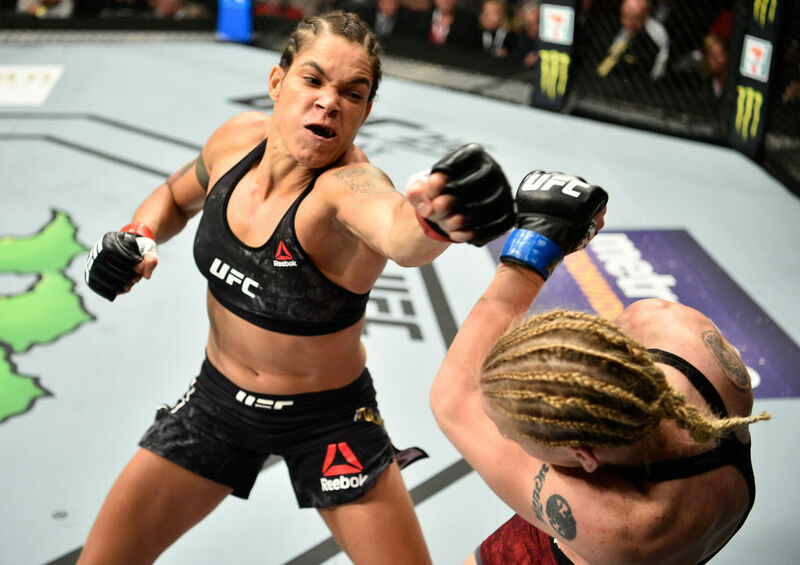 It was close and competitive for 25 minutes, but as the UFC 215 main event between Amanda Nunes and Valentina Shevchenko ended with a Nunes victory by five-round split decision at Rogers Place in Edmonton, it’s clear that with a trio of consecutive victories over Miesha Tate, Ronda Rousey and Shevchenko that the Brazilian may be settling in for a long reign at the top. Scores were 48-47 twice and 47-48 for Nunes, who successfully defended her 135-pound crown for the second time as she repeated her 2016 victory over Shevchenko, which she earned by a close three-round decision. The two traded kicks in the early going, neither surging into the lead. But as the round progressed, it was the champion who began to take an edge as she stayed busy while keeping Shevchenko on the end of her strikes. Shevchenko’s patience began paying off late in the round as she started to land counters, but Nunes was calm under pressure when the frame ended. The war of nerves continued in round two, but Shevchenko got busier as Nunes’ work rate dropped slightly, allowing “Bullet” to pull even on the cards heading into the third. Neither fighter was able to pull ahead significantly in the third, a testament to the evenly matched nature of the bout, and while Nunes marched forward, Shevchenko fired back counters, leaving the scoring of the round down to what the judges put more stock in. The Bahia native looked charged up entering the fourth round for the first time in her career, and she came out fast to start the frame, continuing to work behind kicks to the leg and quick punches upstairs. Shevchenko continued to get her shots in, but she wasn’t busy enough to get Nunes’ attention for any length of time. Midway through the stanza, Shevchenko scored with a nice combination at long range, and she started putting her strikes together effectively as Nunes slowed down. With the bout possibly up for grabs, both fighters kicked off the final round with a heated exchange which, not surprisingly, was an even one. From there, it was clear that both wanted to finish strong, with Shevchenko being aggressive in her attempt to take the title and Nunes picking her shots and even trying for a takedown in order to keep the belt. With under two minutes left, Shevchenko tried to turn a Nunes takedown into a throw, but Nunes ended up on her back on the mat. Shevchenko got back to her feet, but it was Nunes going all-in for another takedown, and she got it with less than a minute remaining. Shevchenko fired off strikes from her back, but Nunes wouldn’t give up the top position, and that’s where she would remain until the horn sounded to end the fight. With the win, Nunes improves to 15-4; Shevchenko falls to 14-3. The rematch was originally scheduled for UFC 213 on July 8, but was postponed when Nunes withdrew from the bout due to sinusitis.